News | Round Rock Women's Soccer League | Round Rock and Austin area soccer for women of all skill levels, ages 18 and up! I am sure all of you know that the newly re-branded and re-formed women’s professional soccer organization in the U.S., the National Women’s Soccer League (NWSL), has recently added a new team in Houston, Texas as a part of the Houston Dynamo franchise. What you might not know is, the Dynamo hosted an open tryout February 15-16, and one of our own RRWSL members was selected to join the Houston Dash for the pre-season! Haley Crane, a goalkeeper for the RRWSL Open Division II Clash, was one of 140 women who answered that call for tryout on February 15. Of that 140, 18 were invited back the next day to advance to the next stage of selection. The final five hopefuls were selected from the 18 women who returned that day – three field players, and two goalkeepers – and Haley Crane was one of them! The selected few reported to Dynamo HQ (picture: bat cave with a gulf view. Just kidding!) on March 8, submitted to a physical and medical evaluation, and began training on Monday, March 10 with the Houston Dash. Round Rock Women’s Soccer League is beyond proud to be connected with this talented woman, and we will be sure to follow her rise as she continues on in her professional career. Though many of us here come out each Sunday for a little recreation, sisterhood, and maybe a bit of fun exercise, we are able to maintain our competitive edge and use it to grow in this game we all so passionately love. Who knows what the future holds for the rest of us? Please join me in a wholehearted, all-caps CONGRATULATIONS to Haley! Follow the Houston Dash and get more info at http://www.houstondynamo.com/houstondash. Thank you for the chance to play. Let my feet be fast and my kicks be strong. And help me cheer my teammates on. The preliminary schedule for Sunday’s games is available. The full schedule will be posted to RRWSL.org soon! We are seeking raffle prize donations for the 7v7 RRWSL Valentine’s Day Tourney on Saturday, February 8th! And let’s not forget the satisfaction that comes with supporting a positive, non-profit community organization! No item is too small! If you would be interested in donating, please contact Faith Bushen or Robyn Hughes to make arrangements. Thank you! Please plan to join us (or send a delegate to represent your team) on Sunday, January 19th from 4:00 – 6:00 pm at the Round Rock Public Lbriary for our semi-annual captains’ meeting. All teams must have representation. More information and agenda to follow soon! The 13th Annual RRWSL 7v7 Tournament will take place on Saturday, February 8th, 2014. Pick up soccer scrimmages resume Jan 5! Shake off that holiday “extra layer” and join us for some pick up soccer beginning January 5th. Ladies 18 and up of all skill levels – whether you’ve played with us before or not – are welcome to play! Bring a white and a dark shirt to form even teams. Scrimmages will begin on Sunday, Jan 5th at 2:30 pm at the Old Settlers Park soccer fields and will repeat every Sunday throughout January. All Games Sun. Nov. 24th CANCELED! Due to the completely, totally, utterly, irrevocably disgusting weather outside, we are CANCELING ALL GAMES for Sunday, November 24th. 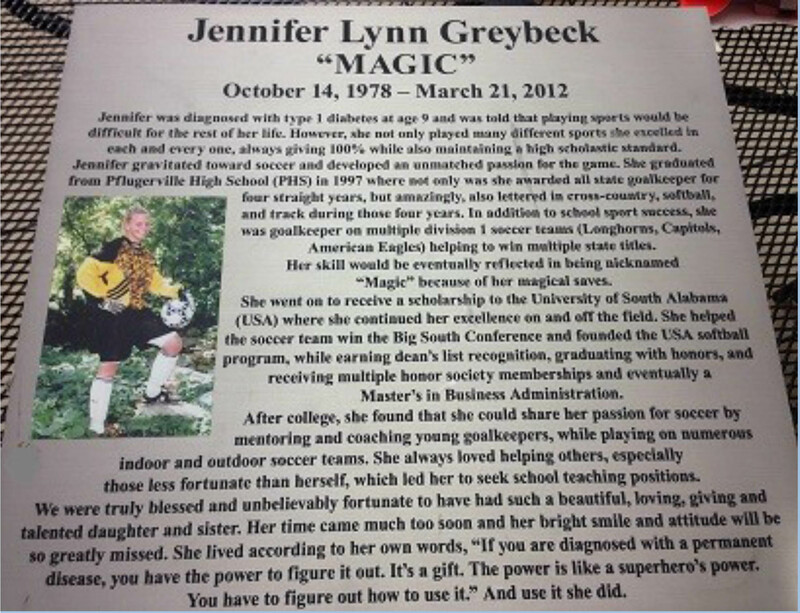 Austin Indoor Soccer will be hosting an adult coed soccer open play tournament in memory of Jennifer Lynn Greybeck. The cost will be $20 per player. You can bring your own team or split up with other people to create a 6 person team. Games will be 4 minutes long and the winner of the open play tournament will be determined by the number of wins their team gets. All the money raised will go to help pay for neon signs, plaques and park benches at the three metro parks to bring awareness to diabetes. The Greybeck’s want everyone to know that even with diabetes, you can still be an outstanding athlete. Date: Saturday, December 7th, 2013 POSTPONED – STAY TUNED FOR UPDATES! I was 40 years old before I played my first soccer game. My daughter played and the parents got to scrimmage them during their final practice. I was hooked. I have no natural talent for the game… Some ladies pick up soccer and WOW… Just like that – they are good! Not me. After 10 years, I am a passable player at best. BUT, that is not why I play. Sure it’s great to win but the sense of belonging and the very cool people I’ve met playing soccer is what keeps me coming back. I’ve made some wonderful friends playing soccer. I get to run around outside and bonus! It counts as exercise! I have played on teams that left me angry after every game. Still, I promised to play and faithfully came to game after game until the season was over. Then, after that season or session, I found a new team that brought the joy of playing back. May I suggest to each and everyone of you that signed up to play… fulfill your promise to the captain. Show up or tell her when you won’t be there. If a team doesn’t suit you, you can change it next season. It’s just 8 games! May I also suggest at we all play with joy? It makes for a wonderful feeling for everyone at plays with or against you. And please… Start thinking now if you’d like to run for the executive board. We need the time, talents and ideas of many to make the league work. Thanks for being the cool soccer girls you are. I’ll be seeing you on the pitch. If we hadn’t had the rain outs, we’d probably have been okay… but they happened and the last games are ending in the dark already. PLEASE be ON TIME! It’s unfair to the people who are there ready to play to short them time on the field. Referees will start their watches at the designated game time and shorten the games accordingly to get them to end on-time.